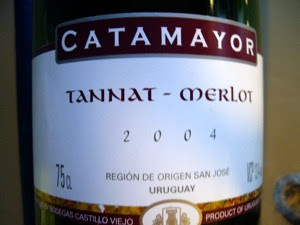 I had never enjoyed a wine from Uruguay before, and I dis some research and found that this country is the fourth largest wineproducer in South America. It is produced by Bodegas Castillo Viejo, in Las Piedras in the department of Canelones. It contains 35% merlot and 65% tannat, a grape predominantly grown in the south of France. Tannat is used to produce the exclusive brandy from Armagnac. Well, it did not have the round and rich aromas I have found in wines made from the merlot grape. It was more like an italian wine, with blackcurrant, and cherry aromas, and it had a bitter aftertaste. It was not a wine after my taste.